← The Name Shirley Teter Should Be On Every NC Media Site. It’s Not. A North Carolina General Assembly member has used their official state email account to send a voter newsletter which contained a donation solicitation on behalf of non-profit, Democracy NC. Representative Susi Hamilton (D-NC 18), of New Hanover, Brunswick Co., and Wilmington, sent out the email blast styled as a press release using her official state account on Monday, October 24th. The content was exclusively from Democracy NC, a staunchly Left-leaning 501(c)3 non-profit. The text, “You can support our work by making a donation today” is found near the bottom of the email. When one clicks that “making a donation” link, one is sent to Democracy NC donation page in support of the “Souls to the Polls” campaign. “Souls to the Polls” is also the name of the Moral Monday voter drive campaign. 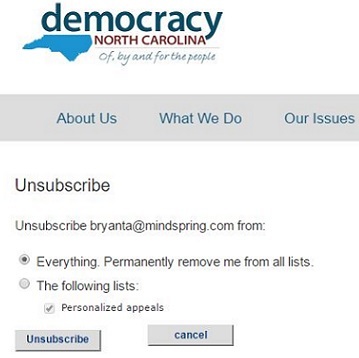 When examining the other links in the email, the “unsubscribe here” text sends you to Democracy’s NC’s website, however, the form was bizarrely pre-filled in with a personal email address (image right). That personal email address has been confirmed as belonging to state Senator Angela Bryant (D-NC4). This same mindspring.com address is also displayed on Sen. Bryant’s personal campaign site and is also published in the Women’s Forum NC Directory. It is unclear why Senator Bryant’s personal email is associated with the Democracy NC email template that was used by Representative Hamilton. Democracy NC’s 2014 IRS 990 filing showed the group’s total revenue standing at over $1.8 million dollars. The previous year, total revenue was over $1.1 million. This article first appeared at American Lens News on October 27, 2016. This entry was posted in Am Lens, NCGA, POLITICS NC and tagged Democracy NC, Ethics Violation, Susi Hamilton. Bookmark the permalink.